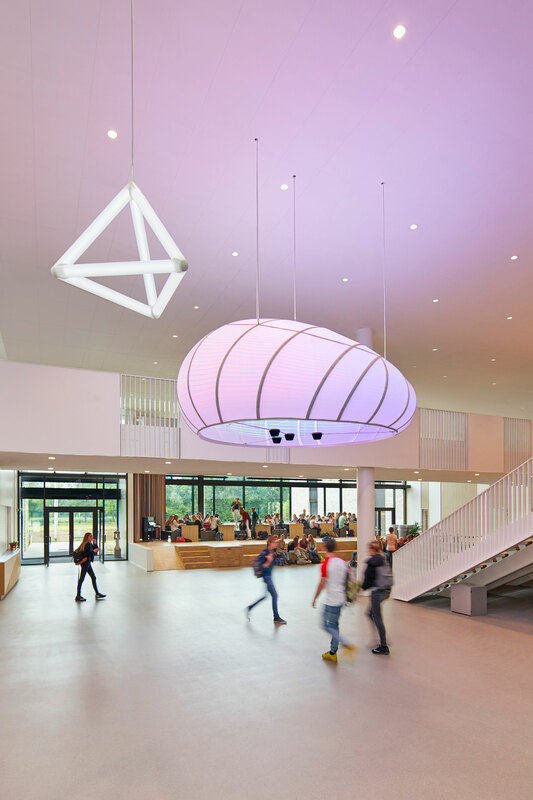 For the new building of the Carmel College Salland in Raalte – designed by Atelier Pro – an extraordinary work of art has been realised, by Studio Dennis Parren from Eindhoven, inside the auditorium of the school. The Carmel College’s school administration is convinced art is an elementary component of school environment, because it excites the spirit, asks questions and triggers curiosity. For art advice, and to guide the project subjectively, the impressario for art projects ‘Kunst en Bedrijf-Gabi Prechtl’ has been brought in. The artwork is displayed in the multifinctional auditorium – the heart of the school – where 700 students meet during coffee breaks, but the auditorium is also used for theatrical plays, parents’ evening meetings, seminars and graduation day. 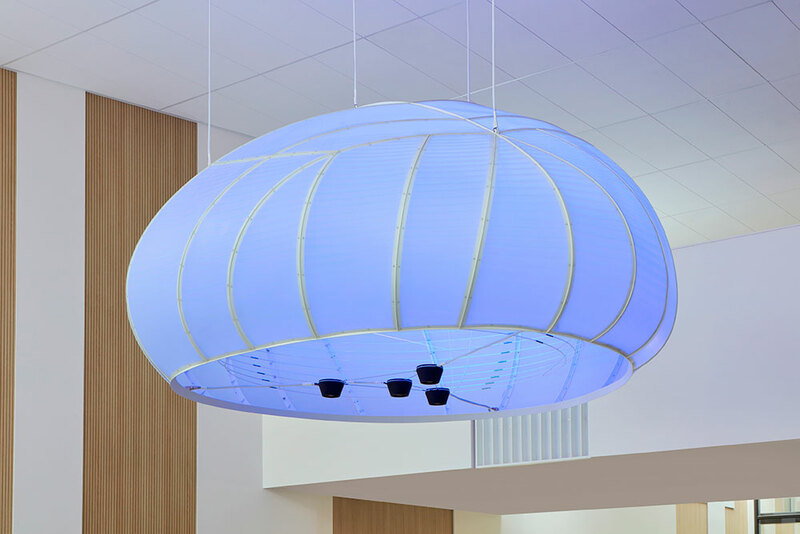 Different purposes that all demand their individual spaces, and that’s why this artwork needed free space, floating above the bustle of activities, but still connected to the auditorium by an air bridge and a broad staircase. Visible from every angle, the sculpture, a light work of art, speaks to the imagination and is always close at hand. Through a selection process, designer Dennis Parren was chosen. A designer who stood out with his CMYK lamp during the Graduation Show 2011 at the Design Academy in Eindhoven. 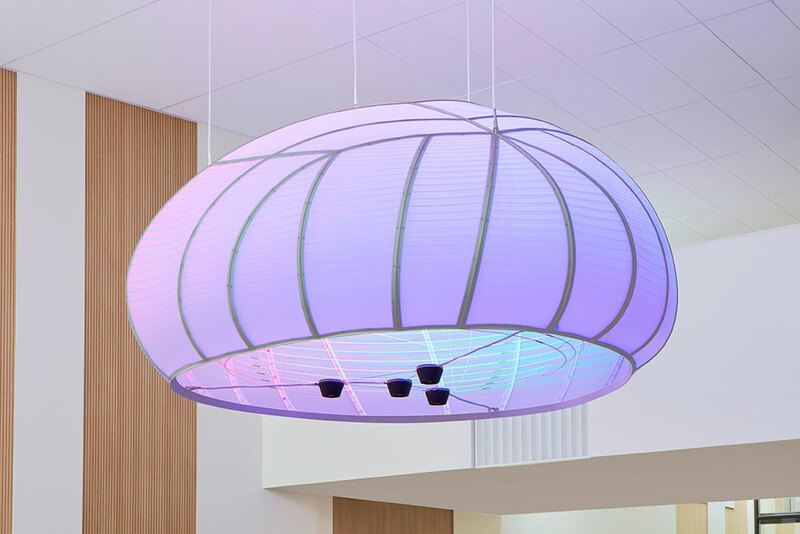 The CMYK lamp is a wire sculpture that spreads coloured shadows on the ceiling and on walls. The Carmel College assigned Studio Dennis Parren with a complex task. They asked him specifically to not build a lamp, but to design a sculpture that mainly focusses on the play of light, shadows and shades. A sculpture that relates to the size of the auditorium and consists of multiple elements. A sculpture that – due to the organisation of space, the broad staircase and the air bridge – uses its perspective effect to its full extent. A sculpture that, with its thematical versatility, sheds an interesting light on the mulltifunctional space. An assignment that fitted the designer like a glove. 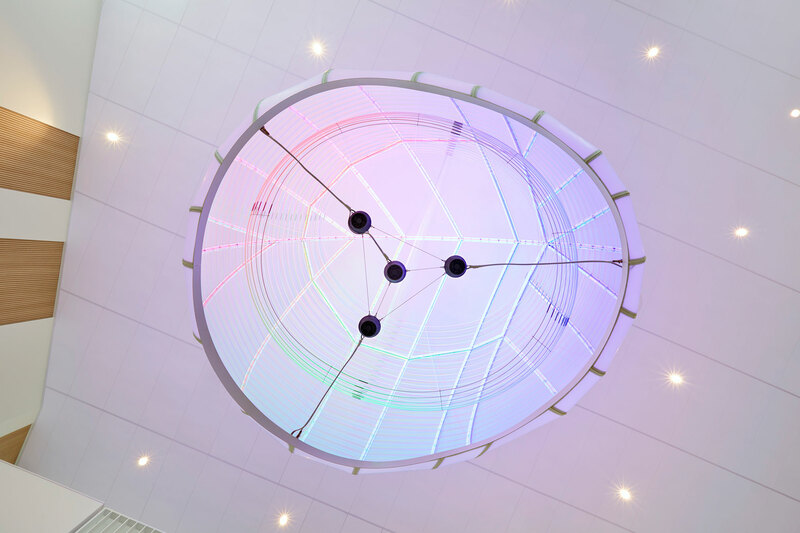 The light sculpture, called Serendipity, consists of two parts but still forms one entity. One part is a cuddly cloud, a medusa-like shape, built out of steel ribs and draped with milky artificial skin. A filmy structure of rings, that floats within the cloud, almost resemble its intestines. The entity is lit from inside by 4 led lights – actuated by a computerized system – that breathe life into the object in and endless play of colours and shadow tints. 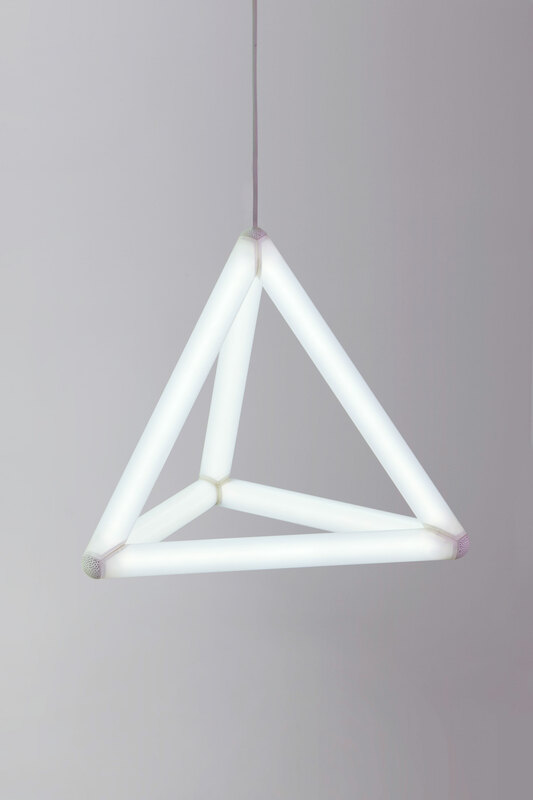 The other part is a placid, mathematically shaped object, the tetrahedron (a solid figure with four plane faces), built from tubes that spreads white light from inside. Studio Dennis Parren was given the opportunity to show, within a contract situation, that they – as designers – were perfectly able to work within a framed assignment that fully fitted the architectonical setting. They succeeded to build a sculpture, not just a lamp, that shows a contineously changing play of colours, lights and shadows. A sculpture that, because of its puzzling shape and composition containing two opposite parts, is remarkably present in the auditorium. With this design, he lets students and teachers be a part of his fascination for the elusiveness of light, and this way he hopes to trigger their curiosity. Light, that is ordinary and inscrutable at the same time. Despite the fact that he thinks from light and wants to know all about it, he would rather call himself a designer of shadows. Because where there is light, there is also shadow. And that yields unanticipated finds, provided one is open to coincidence and luck. The artwork for the Carmel College is therefore a sculptural ode to the phenomenon of serendipity, and is captured in its eponymous name.